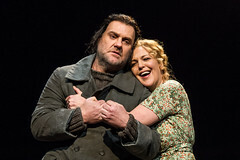 Tim Albery’s acclaimed production is a darkly insightful account of Wagner’s early masterpiece, starring Bryn Terfel conducted by Andris Nelsons. Senta accepts the Dutchman's offer of marriage. But the Dutchman wrongly suspects her of unfaithfulness. Thinking he's protecting her, he leaves to resume his endless voyaging. Senta is left alone. Shortly before the premiere of Der fliegende Holländer in Dresden, Wagner had returned from a deeply unsuccessful two-year stint in Paris. He had gone there to make his fortune, but found his way barred by a strict class-based system. One of the bitterest blows came when Léon Pillet, director of the Paris Opéra, accepted his libretto for Der fliegende Holländer – but then commissioned a score not from Wagner but from French composer Pierre-Louis Dietsch. But the Dresden premieres of first Rienzi in October 1842 and Der fliegende Holländer in January 1843 were immense successes, and marked the beginning of Wagner's career as one of the greatest operatic composers. 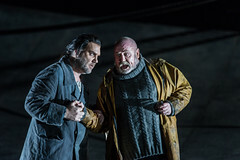 Tim Albery's Olivier-nominated production for The Royal Opera delves deep into the psychology of Wagner's cursed wanderer and his beloved Senta, detailing the monomania and uncompromising idealism that finally drives them apart. Michael Levine's elemental single set is dominated by a rolling metal hull that represents the Dutchman's phantom ship, the poverty of Senta's home and the treacherous sea. To find out more visit the Der fliegende Holländer (2015) production page.